Copyright: 2017 Siddharth Tevatia, et al. This is an open access article distributed under the Creative Commons Attribution License, which permits unrestricted use, distribution, and reproduction in any medium, provided the original work is properly cited. Clowning is a form of humour. It is an art form that invites play, interaction, and laughter. Clown Care is a programme in hospitals and medical centres involving visits from specially trained hospital clowns. Clowning helps patients to focus on something other than their illness. Olsson et al. and Spitzer suggested that clown care could create a warm climate, promote good interpersonal relationships, and relieve feelings of frustration, anxiety, or hostility. Hospital clowns work worldwide as a health humanization resort, providing interplay with patients, family and staff creating a positive emotional state that fosters affirmative environmental conditions. This type of activity varies greatly in terms of professionalism, accountability and artistic methods. Promotion of emotional and psychosocial well-being of patients transcends opportunities for oral health promotion activities in hospitals, schools and community. Previous research reports on clown training reflects attitude-building potential for the healthcare students provided that it is performed in a deep, essential, strict and continuous fashion in a facultative manner rather than mandatory allowing the student to build his own artistic, professional and personal path. Thus, the prospect of introducing training curriculum of this underrated non-technical skill for dental students in Indian dental education system needs to be harnessed. A CLOWN can be succinctly defined as a performer whose act is to amuse people. Clowns have been regarded with the “gift of laughter”. But now, this has been expanded in the arena of health care systems by the “gift of healing”. Presence of professional clowns as members of health care teams begun in 1986 . Clown doctors parodied the work of medical doctor so that they would appear less scary to young patients. Role of clowns in dentistry can fight with the fears and doubts of a young patient. Mostly, little people present with an innate fear or developed during any past experiences. Fear of needle or sound of a bur makes a child go through wars within his head. 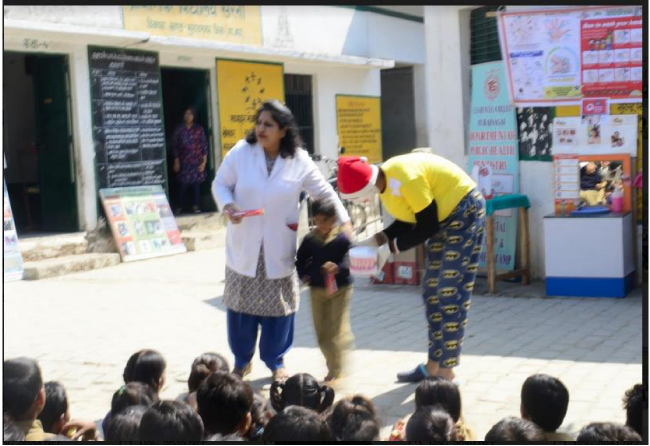 Dental clowns connect with the children easily, adding humour to the experience using holistic methods. This shows a great impact and also contributes to handling process, recovery process and psychosocial well-being of the ‘little creatures’ . Entering the environment of teeth makes children fearful and a head with lots of unanswered questions. But responding to play is easier than a tortuous machine entering into the mouth. Dental clown make the children comfortable. Children respond to play and this has an impact on emotional and cognitive development. The interaction between Dental clown and the children encourage them to get inspired, develop new skills and learn new tricks. Clown intervention induces positive stimulation boosting confidence and courage into little patients, eases anxiety and stress and makes their experience colourful . When dealing with patients, dental clowns must be able to integrate artistic skills (e.g. music, comedy, mime, magic or puppetry), which are useful in eliciting positive emotions, with personal qualities, such as empathy, emotional intelligence, and intuition. In this way, dental clown can establish therapeutic relationships with patients and help to decrease their pain and other negative effects associated with their illnesses, as well as contribute to their well-being and create a lighter atmosphere . The paper illustrates that besides the typical clown tools and techniques, the medical clown uses role strategies as therapeutic interventions in the interaction with patients. In the last three decades, medical/dental clowning was introduced into hospitals around the world as a tool that helps to “promote wellness and improve physical and mental health and quality of life of patients, their families and the healthcare staff who interacts with them” . The medical/dental clown is often seen as the one in charge of introducing some laughter into an otherwise unhappy setting, keeping in view the fear, pain and sadness being perspective of a medical/dental centre . Clowns help the patients and their families to get distracted, even if only momentarily, from the unpleasant situation in which they find themselves on the other, they try to improve the quality of life of the hospital and its staff through the introduction of humor and comic relief [4,5]. A research also suggests that laughter causes secretion of adrenaline which increases the blood flow and level of endorphins in the brain, decreases pain, infections and helps accelerate the recovery process. Research suggests that humor and laughter help to alleviate stress and stress-related symptoms, foster the patient’s general sense of wellbeing, and improve people’s immune system . Moreover, psychological sources indicate that the use of humor brings about pleasure, forms a relaxed atmosphere, and enables the patient to cope with the fears and anxieties caused by hospitalization . Clown’s healing impact also includes the ability to build a supportive relationship, express emotions and sympathetize with the patient . We will examine the concept of role, will look at the role of the ‘clown’ in its archetypal dimension, discuss the role of the ‘patient,’ and try to establish their connection with Landy’s notions of role, counterrole, and guide. Clowns are comic performers who employ slapstick or similar types of physical comedy, often in a mime style. In anthropology, the term “clown” has been extended to comparable jester or fool characters in non-Western cultures. In short, he’s a comedian, someone who tries to make you laugh by being funny. He has a certain look, and acts it out in a special way (Figure 1) . Humor involves cognitive, emotional, behavioural, psychophysiological, and social aspects. Humor can refer to a stimulus such as a comedy film, a mental process such as perception, or a response such as laughter and exhilaration. Humor causes reductions in cortisol, growth hormones, and epinephrine. Following laughter or other humorous encounters, natural killer cell activity, immunoglobulin G and immunoglobulin M levels increase for as long as 12 hours, and these evaluations bring about beneficial health outcomes. The use of humor consistently results in improvements in pain thresholds. Figure 1: Dental student become clown to motivate old patients “STOP SMOKING”. The role of the clown is not limited to entertainment: In many cultures and civilizations the clown, court jester or fool also acted as a critic of the regime, a true social rebel who, in spite of his/her seeming stupidity (or precisely by virtue of it) was able to voice the truth sharply and clever . According to Landy, the fool belongs to the cognitive domain and presents two subtypes: the trickster and the existential clown. These subtypes constitute some of the variations of the archetype: . The function of the fool is to charm the master (and the audience) on the one hand, while offering up a critique of his foibles on the other. (…) There is a certain safety in his barbs and insights, in that he never has to be taken seriously because of his low social status. He establishes an empathetic bond with members of the audience, who, sharing in his privileged knowledge, desire to remain like him - superior in their own wisdom, though often at the expense of another. The most recognisable modern clown character is the Auguste or “red clown” type, with outlandish costumes featuring distinctive makeup, colourful wigs, exaggerated footwear, and colourful clothing. The comedy that clowns perform is usually in the role of a fool whose everyday actions and tasks become extraordinary—and for whom the ridiculous, for a short while, becomes ordinary . From a drama therapy perspective, Handleman’s (1990) ideas that clowns can carry through their actual presence a kind of dramatic reality that accompanies them like a surrounding aura. Thus, when medical/dental clowns meet the patients, they are taking the intermediate zone wherever they go, recreating it through their physical presence. Thus, clown’s invitation to the patients to immerse, become engaged with, or participate in the world of as if is a swift and natural transition that prepares the ground for the expansion of roles and the development of emotional flexibility . Being a patient is a complex experience-if not a traumatic one. It involves various examinations which produce feelings of apprehension about the procedure to be done, uneasiness and fear of pain, or anxiety about being dependent on the dental staff and lacking control over one’s life . The perspective of a dental clown towards dental patients is to distract them from the fear of taking a treatment an engross them in an aura that is friendly and not disturbing. This way dental awareness can be spread among the children especially and their parents and can be encouraged. Dental clown begins the process by accessing the attitude of the patient. By assuming certain attitudes about the ‘patient’ role, they prompt people to undertake additional roles, complementary roles, or discover counter roles. In some instances, the clown behaves in a way that appears to take no notice of the role of the ‘patient’ either by refusing to take its qualities and functions for granted, or by relating to other aspects of the person beyond their role as ‘patients’. Likewise, the clown’s alleged ‘ignorance’ about dental conditions and their procedure for treatment allows them to offer a different version of reality that is ruled by curiosity, misunderstanding, and ridicule. The clown’s attitude produces a liberating impact because it frees the individual from the static posture of the ‘patient’ role . Different perspective of a clown is imbibed in specific attire that he takes up. For example, the white clown, or clown blanc from the original French, is a sophisticated character, as opposed to the clumsy auguste. They are also distinguished as the “sad clown” (blanc) and “happy clown” (auguste). Also the clown being a jealous one helps in this respect. Such a clown can help a child fight the cavitated tooth with a simple restoration or make him/her feel happy about the healthy teeth. He highlights a few of the positive sub-qualities that the role of ‘patient’ possesses: being special, being treated. Thus the dental clown acts as a guide that prompts the child to explore other aspects of the role . Whiteface clown, also known as ‘comedy’ or ‘Grotesque whiteface’ emphasises on features such as red nose, red mouth and partially red hair. 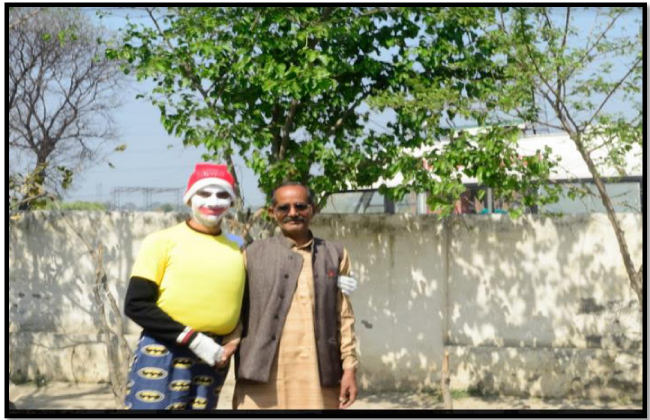 This kind of a clown can be helpful in school camps, village camps or places where dental education is to be provided. For example, teaching children about the dental aids, types of brushing and measures to adopt for healthy teeth and gums can be done by whiteface clown. Children do not understand the instructions given in a bland way. Including drama (Figure 2), colours and fun can help them understand the usefulness of receiving the right way of living (Figure 3). Figure 2: Dental Clown in school dental program to educate students. Figure 3: Brushing Technique teach by dental clown to motivate student to maintain Oral Hygiene. Drama helps to distract and attract everyone (children or adults) towards the message that one is trying to convey. Being a clown, he can play the role without eliciting a sense of danger in the patient, not only because his essence as a ‘fool’ provides him with an appropriated aesthetic distance, but also because the patient never see him as a person: the clown is always in role (Figure 4). This ‘role protection’ creates a situation in which it is very unlikely for the patient to confuse the fictional world of the clown with reality . 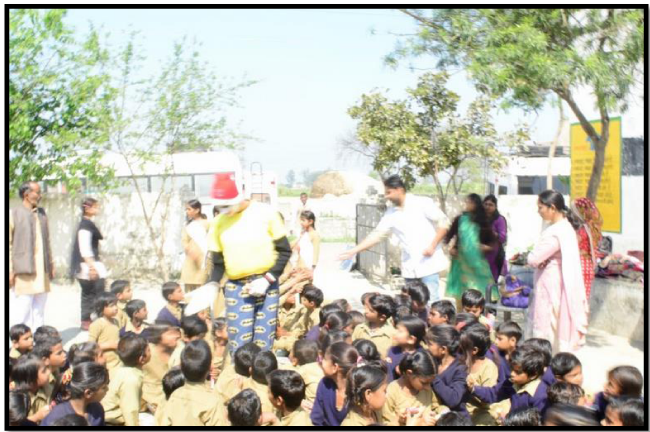 Figure 4: Interaction with school children making environment fearless before going to Dental examination. Here comes an example of a 9yr old suffering from pain in his 1st molar due to caries. The clown helps to make him comfortable by referring to the cavitated tooth surface to an evil vampire and to fight that and to kill that several equipments have to be used. This description portrays an imaginary world like this: an evil looking vampire with wide eyes and long tail, equipped with magical powers and agenda to eat away all the teeth and give pain if not killed. In spite of the seemingly violent narrative, through their incursion into this imaginary world, the children get in touch with two sources of power-expressing anger and being part of a group-both of which may be useful as vital coping strategies. This helps as children cooperate with injecting them and treating which would be impossible otherwise. The clown in this role serves as a guide that enables them to pursue the fantasy within a controlled environment-through dramatic means and humour. One way of supporting patients is to stand empathically by their side, provide room for the expression of feelings, or encourage their empowerment. However, if a patient is in such a passive state that s/he cannot even recruit the inner strength required to get into dramatic reality, the dental clown has two choices: S/he can go along with this mood by creating a pleasant atmosphere, using soothing tools (soap bubbles, balloons, etc.) in an attempt to comfort the patient; or s/he can choose to make an intervention that challenges patients, prompting them to move into other (more functional) roles. In line with the need of eliciting the patient’s survival tools, dental clowns may position themselves as antagonists to the patient, and from this angle, challenge him or her to confront them . For example, there is a kid who had a fall from the stairs and hurt his maxillary central incisor, also had an avulsion of his mandibular central incisor. His parents were being offended and his father was scolding him for not being careful. But in this situation he had to cope up alone. Dental clown here was not being encouraged by the parents although it could help the child. Detached from his shielding parents, clown forced him to find his ‘inner warrior.’ He achieved this by undertaking the role of the ‘antagonist:’ He did not allow the injured boy to remain in the role of the ‘defenseless and passive one,’ eliciting compassion and depending on external forces to save him. In order to invoke the role of the ‘warrior’, this dental clown had to challenge the kid, avoid surrendering to his automatic crying response, and hold on to the belief that somewhere inside him, there is a dormant warrior that needs to be awakened. The boy’s realization that his ‘passive-dependent’ role is useless in this situation, and that there was no one else to rescue him but himself, activated his ‘warrior’. So, the roles of the overprotective parents were substituted in dramatic reality by the two dental clowns who joined the scene, encouraging him to be active. Having recruited his inner power, this kid was strengthened by external support as well. After the splinting of the avulsed tooth and treating the fractured tooth, the kid gained courage and felt strong. The fact that his mother witnessed him as a ‘fighting hero’ was also very meaningful, as it provided additional recognition to the role - the imaginary realm thus gaining a place in the real world as well. According to Landy’s perspective, he conceptualized the patient as the hero in a drama. Landy identifies two recurring features of the hero’s journey: the will to cope with the unknown and the wish to go out on a spiritual quest. For the patient (surely, for a child) it may be hard to regard illness as a journey. Usually s/he would be concerned with the wish to be healthy and the will to return to normal and painless as soon as possible. However, just like drama therapists, dental clowns are also capable of turning the experience of a visit to a dental clinic or hospital into a story by holding the metaphor of the journey for the hero/patient-a journey that involves coping with new and frightening situations. In this sense, the dental clown can be acts as a ‘guide’ who escorts the hero/patient into the unknown world of hospitalization, trying to help him/her discover their own inner powers . Nevertheless, being a liminal creature par excellence, the dental clown is helps in integrating and holding together the physical and the emotional planes, the pain and the humor, connects the dental staff and the patients, and therefore of becoming a ‘guide figure’ in the landscape of the staff and in the patient’s world . According to Grinberg, not only the clown and the patient was involved but also the family members can be involved, the clown can roughly assess a hero who is passively stuck in a plot, and recruit the theatrical roles of ‘playwright,’ ‘director, and ‘performer,’ in order to look for the most effective way of advancing it. Family members might be casted by the clown into complementary, supportive, or antagonistic roles, in an attempt to move on the plot or urge the hero into action . The dental clown works in states of continuous stress in which interventions are needed that require not only regular clown’s skills, intuition, and sensitivity, but also therapeutic vision. Their work is psychologically intricate and complex. As the profession of dental clowning develops, their duties also expand from those of a funny entertainer to an integral part of the paramedical team: They escorts the patients and their family through their stay at the hospital, in a process that may last weeks, months, or even years, and may involve repeated hospitalizations. They must quickly develop contact with them, as well as getting to know the needs of the patient and his/her coping capability. Thus, it becomes apparent that it is not enough for medical clowns to come in with the sole purpose of changing the atmosphere and entertaining. In some cases, the relationship calls for a continuous process, in which the clown can act as the guide in the child’s journey with the illness and hospitalization processes. Besides all the usual clown’s tools and techniques, many of the skills that medical clowns have been developing in the field involve the use of roles. It follows that drama therapy theories and concepts, and role theory in particular, can assist the medical clown conceptualize their work. Carp Ch. Clown therapy: The creation of a clown character as a treatment intervention. The Arts in Psychotherapy. 1998; 25: 245-255. Warren B. Fools for health: Introducing clown-doctor to Windsor hospitals. In B. Warren (Ed. ), creating a theatre in your classroom and community. Ontario, Canada: Captus Press. 2002; 225-246. Winnicott DW. . Playing and reality. London and New York: Routledge. 2005. Green T. (Ed). Folklore: An encyclopedia of beliefs, customs, tales, music, and art. Santa Barbara, CA: ABC CLIO. 1997. Landy R. Persona and performance: The meaning of role in drama, therapy, and everyday life. New York: The Guilford Press. 1993. Handelman D. The clown as a symbolic type. In Models and mirrors: towards anthropology of public events. New York: Cambridge University. 1990; 236-262. Landy R. The couch and the stage: Integrating words and actions in psychotherapy. Lanham, MD: Jason Aronson. 2008. Grinberg Z. Medical clowning: Therapeutic intervention in short term and continuous stress situations that stem from illness and hospitalization: The drama therapy viewpoint. Unpublished MA thesis, Lesley University, Graduate School of Arts and Social Sciences. 2009.